IP audio is now established as THE networking standard for broadcast. Wheatstone, a leader in broadcast audio networking since 2000 and the first to bring complete networking solutions to the IP Audio world with their WheatNet-IP Intelligent Network, has superior solutions that cover every broadcaster's needs - now and into the future. And with their full support of AES67, Wheatstone's BLADE-3s can interface with any AES67 compatible gear in the market to transport audio, making their gear completely format agile. With the IP-12 and IP-16, Wheatstone looked at the most affordable way for radio stations to hop into the IP audio world. Both have become favorites for installation into production and broadcast studios. By moving the audio, logic and interface functions out of the mixer and into a single rackspace unit (called a BLADE), Wheatstone are able to provide a significant boost to the flexibility, power and futurability of this console. Tapping into the power of WheatNet-IP Intelligent Network technology through the use of the included IP88CB Console Audio BLADE, it’s a perfect low-cost, small-footprint solution. AND it’s a great way to start or expand a WheatNet-IP network. 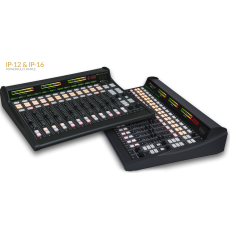 The IP-12/IP-16 starts with a 12- or 16-fader control surface that looks and feels exactly like a self-contained console. Each of the input modules is equipped with an LED source name display and an A/B source selector whose sources can be set via a rotary encoder in the master section. Each input module has access to four program busses and has cue and talkback switches. A 100mm high-quality long-throw fader and lighted channel ON/OFF switches round out the module. The master section offers control room, studio, and headphone controls with source selection, as well as an onboard amplifier and headphone jack. Timer controls, a master talkback button, and a built-in cue speaker with level control are provided. There are four event switches and six programmable buttons available for user functions. The meter bridge has three stereo pairs of bright 30-segment horizontal LED bargraph meters, as well as an on-board timer with controls located in the master section. It’s exceptionally powerful while being exceptionally easy to use. For the IP-12/IP-16, we’ve moved the logic, audio and interface to a single space rack unit we call the IP88CB Console Audio BLADE. This mix engine and I/O unit handles all the interfacing and heavy lifting. It connects to the IP-12/IP-16 control surface via standard Ethernet. The two of them together make an incredibly powerful self-contained console. But there’s more – they enable you to become a part of the WheatNet-IP network (if you have one, of course). This means that with the IP-12/IP-16, you’ve got the first building block to a networked facility or you’ve got another station on your existing network. Either way, the functionality you get with the IP-12/IP-16 is pretty breathtaking. We’ve built the IP-12/IP-16 (in New Bern, NC USA, by the way) to be easily accessed by you. No ‘one-surface, gotta take the whole thing apart construction’ here. If you need access to a channel, all it takes is two screws and you’re in. Makes it a breeze to service or simply swap out a module. Source Select Any input can be called up on any channel on the IP-12/IP-16. This means the feed you’ve got plugged into input 7 on the back of the BLADE (or ANY BLADE) can also show up on channel 2…or any other channel. Same with any input! Not only that, you can assign a backup or different source to the same channel and switch on the fly by using the SOURCE A/B buttons. As if this isn’t cool enough by itself, think about the flexibility if/when you decide to link the IP-12/IP-16 up to a network. Imagine having any source on the network at your fingertips, with no patching. Each fader has a dedicated Mix-Minus output (activated by the TB switch) that includes all active faders on its selected source bus, except for itself. These auto generated monaural Mix-Minus signals may be routed to feed telephone hybrids or other devices as required. Alternately, these outputs may be set to provide a separate direct output from that channel only, consisting of the source assigned to that channel. This is very useful for multitrack production work. The IP88CB provides powerful interface options, including four AES inputs, four stereo analog inputs, four AES outputs, and four stereo analog outputs on RJ45s; control room and studio stereo analog outputs on XLRs, two mic level inputs with gain trim and switchable phantom power on XLRs; cue and headphone outputs on both RJ45 and 1/4" TRS and 12 GPI logic ports on RJ45.